As your quit matures things happen and cigarettes no longer cross your mind. Some funny things happened to me on the way to the zoo. I will try my best to keep it short. I am usually up by 6:00 am but this morning I woke up late. What caused me to sleep late? Hmmm Hasfit, Fitbit, Walking, Squatting, Edging the lawn...all of that. As I laid in bed getting my thoughts together, I remembered I had to have the SUV serviced and inspected @ (8:15) am. It was now 8:24! I scurry around to get dressed. Gather some reading material thinking I can wait for coffee, they have the best there. Got there 25 minutes later. The receptionist tech did not seem too happy to see me. You know the look, you are late! Okay, I am still smiling, apologizing for being late. Spreading Joy instead of smoking. I go into the lobby grab that magnificent coffee, hmmm Joy instead of smoking. Gosh, it is so hot I have to let it cool. In the meantime, I check emails, messages etc on my phone, flipping channels on the tv etc. Notice my reminder for car service flashing. There is Joy instead of smoking. There is Joy instead of smoking. They have a shuttle which is out on the road but she can't tell me how long it will be before it returns and she wasn't making any effort to find out. Okay no problem, I have a grandson that drives now. He is only ten minutes away. I contacted my daughter to get permission. After a delay my grandson finds me. I was proud. It was so cool being with him. He is going off to college in a month. This was a special time for me. He has become a pretty good driver, I'd say. He drops me off and waves goodbye. I stop and sit on the porch for a few minutes and realize... I don't have my house key. Oh, what Joy there is instead of smoking. Thankful for all those jumping jacks, crunches and squats, it only took two attempts to hoist up to climb through the window to get inside. There is joy reading your post I just find you utterly charming, Jackie! Honest, expressive, and real. You live in joy and it's wonderful for us to read about it! Thank you, thank you, thank you!!! Thank you Sheri, I enjoy your blogs as well. Joy. When we allow God to be in control of our day that he has given us, there is still joy no matter what we are going through. Fruit of the Spirit. Through it all, it was still a really great day. Have a wonderful day as well. Keep on keepin on. Thanks for your comment. Thank you for this BEAUTIFUL blog, Jackie. You are absolutely a joy in and of yourself. Thank you Lady E. Have a marvelous day. Such a positive message for today. Thank you for sharing! I really enjoyed reading this. I REALLY enjoyed this blog Jackie! But----just in case you have a really "fit" burglar.......better close that window. I am going to print and post this. 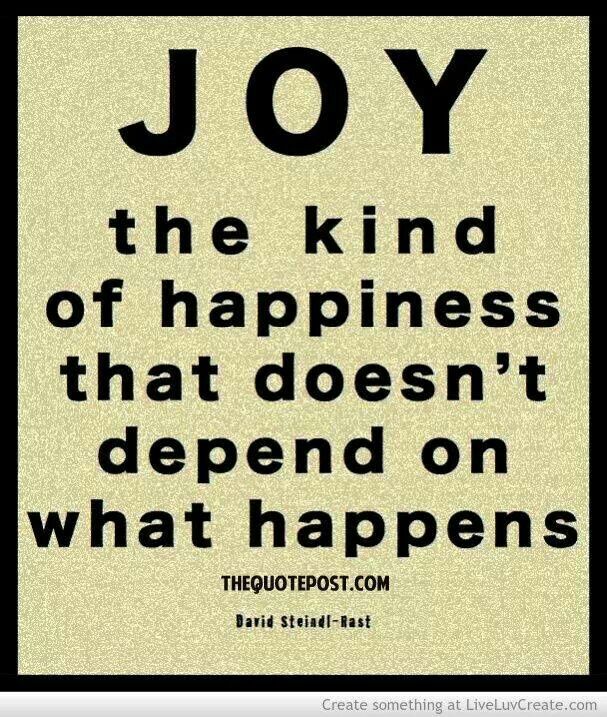 Good explanation of Joy. I hate to say this but I am sitting here laughing. The house key was the clincher to an amazingy "joyful" day! lol $191 for A tire for a SUV? Wow. Move here to middle Tennessee. There are no "inspections" here that you have to pass. And tires don't cost nearly that much. Glad you were able to find the joy through it all. And the humor! More power to you, Jackie! Tennessee, I pass, I would not feel safe knowing "no one" gets their cars inspected. The only vehicles that do not have to have inspections here are farm vehicles. Along with a disposal fee, I am sure the dealer pads the cost of the tires. Just guessing maybe 30-50$. Yes, that was a very brief summation of my joyful day. I think cigarettes caused us to be upset about a lot of things. I read this again this morning and all I could think of was, "Mama told me there'd be days like this." Yes, Lady E, there are days like this. The best part, I was not upset and just rolled with it. I reflect because those are the moments that I "would" have smoked. Not smoking really takes the stress out of your life. Truly. Have a blessed day.